Spanish: Is spoken by 84% of the population. La Paz, Bolivia, is a good city to learn this language since the accent there is neutral, as it is in Mexico City and Bogotá. Quechua: is spoken by 28% of the population. It was the common language of the Inca and is currently spoken in Cochabamba, Tarija, Potosí and Chuquisaca in Bolivia. Aymara: Is spoken by 18% of the population and is one of the oldest Latin American pre-Colombian languages. 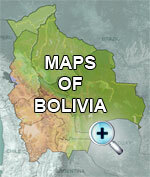 It is spoken in Bolivia in La Paz and Oruro. Guaraní: Is spoken by 1% of the population. This is the native language of the Guaraní, an ethnic group from the Chaco and Amazonian regions. It is one of the official languages of Paraguay. In Bolivia it is spoken in the department of Santa Cruz.